Low-grade appendiceal mucinous neoplasms (LAMN) are rare tumors that, once ruptured, can lead to pseudomyxoma peritonei (PMP). Hyperthermic intraperitoneal chemotherapy (HIPEC) is typically offered to patients with ruptured tumors; however, the current classification system of peritoneal location and implant grade may not provide a sufficiently accurate prognostic tool. A retrospective analysis was performed on all patients with LAMN at our high-volume institution. Pathological specimens of appendiceal tumors, as well as peritoneal deposits if applicable, were examined to confirm the diagnosis of LAMN. Mucinous adenocarcinomas were excluded. Pathology reports were used to classify all patients into four categories: (1) non-ruptured LAMN, (2) peri-appendiceal mucin deposits, (3) diffuse spread of acellular mucin, and (4) diffuse spread of mucin containing neoplastic epithelium. 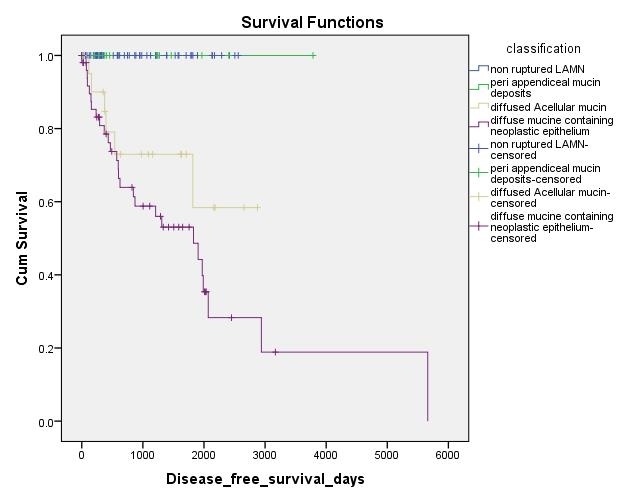 A total of 167 patients with LAMN underwent resection from 2000-2018, with a median follow up of 28 months. Of these, 80 patients were found to have non-ruptured LAMN, 13 had peri-appendiceal mucin deposits, 22 had diffuse spread of acellular mucin, and 52 had diffuse spread of mucin with neoplastic epithelium. Lymph node metastases were not found in any patients. HIPEC was administered predominantly in the groups with disseminated mucin (group 1: 4%, group 2: 15%, group 3: 68%, and group 4: 81%). Additionally, the predicted radiologic Peritoneal Carcinomatosis Indices (PCI) were overall lower than the operative PCI (group 1: 0 vs 0, group 2: 1 vs 2, group 3: 18 vs 20, group 4: 13 vs 18). LAMN was often detected at appendectomy or other, non-surgical methods in 36% of group 1 and 50% of group 2. The recurrence rate was significantly higher for the more advanced groups (group 1: 0%, 2: 0%, 3: 27%, 4: 52%, p<0.01), as was the death rate (group 1: 0%, 2: 0%, 3: 4%, 4: 10%, p=0.03). Patients with ruptured LAMN appear to be treated with HIPEC independent of the extent of peritoneal disease or histological features. However, our results demonstrate that the extent of disseminated disease can predict prognostically significant subgroups. Similar to those with non-ruptured LAMN, patients with peri-appendiceal mucin deposits did not recur with or without HIPEC. This suggests that HIPEC may not be necessary in these patients, and that the frequency and duration of surveillance can be scaled back. Nonetheless, predicted radiologic PCIs overall underestimate the extent of disease, and operative exploration may be necessary to accurately determine this parameter.